Hope you’re all enjoying the start of Spring! It’s been a busy month at COASST, with national and regional media attention. Executive Director Julia Parrish was recently featured on the March 20 edition of Science Friday, COASST data were featured in the recent Pacific States Fisheries Management Council Meeting, as #9 of the 12 main highlights in the California Current Integrated Ecosystem Assessment (CCIEA), State of the California Current Report, 2015, and a number of COASSTers were featured in recent news coverage. A big thanks for all of your hard work! Check out the latest on our website in the COASSTal News section. We’re so proud to have all of you representing COASST! Choose webbed (go to Q2), choose completely webbed (go to Q3), choose three toes: all webbed (go to Q4), choose foot not huge – STOP: Alcids. Look carefully – the face has a dark eyeline, or “tearline” – (see key character 2 on the AL3). The Thick-billed Murre has a dark face with a white chin. Non-breeding guillemots with white underparts lack this eyeline; the bill, wing and tarsus measurements for this bird do not fit for the PIGU or BLGU. Common Murre – correct! The bill, wing and tarsus measurements do not fit for Pigeon Guillemot and the underwing is white – Common Murre – great work! Bill is too long for a KIMU and the eye is within the dark part of the face – Marbled Murrelet – nice! 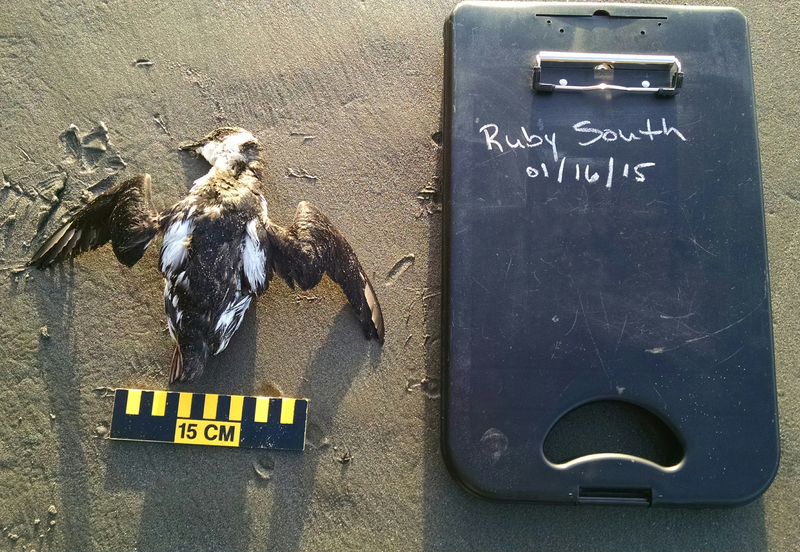 Yep, it is a Marbled Murrelet. 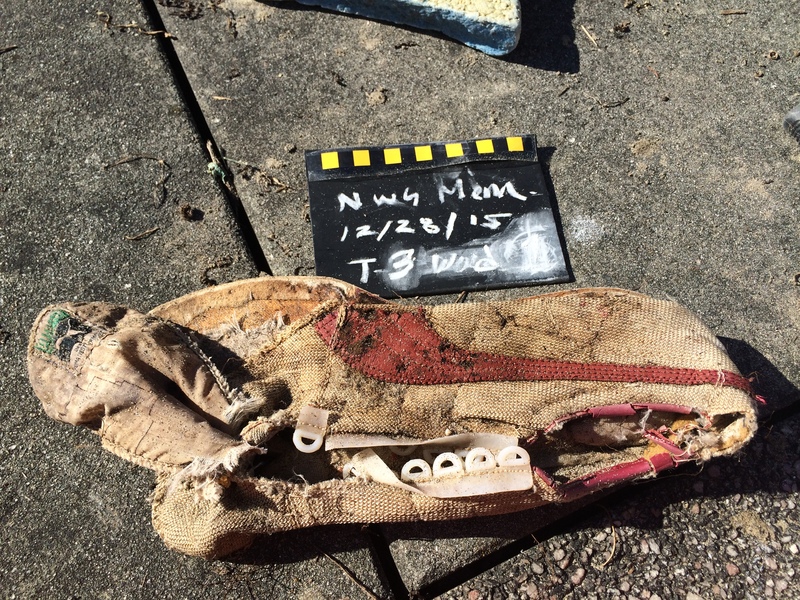 Mike and Chiggers’ marine debris surveys at Norwegian Memorial (WA) tell an interesting story. 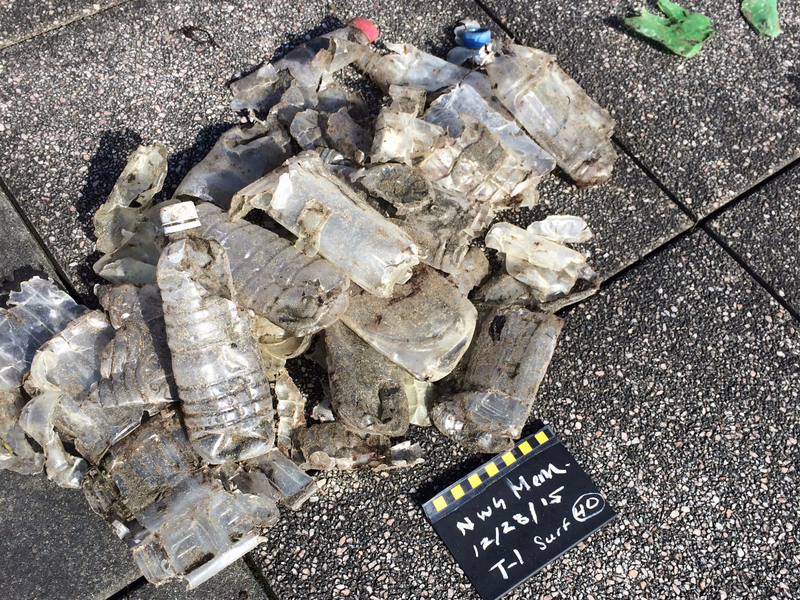 Their beach consistently catches A LOT of bottles and bottle fragments, many with Asian writing. Seen here is the haul from a single zone in a single transect. 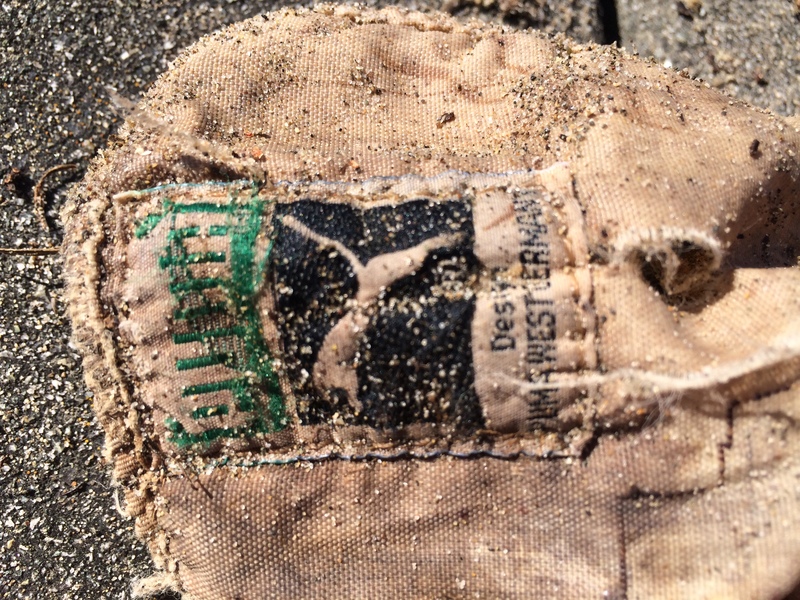 A well weathered Puma shoe also washed up for their December survey. The stitching and lace holes make us think these are “vintage”. Do they remind anyone else of basketball practice in the 70s? 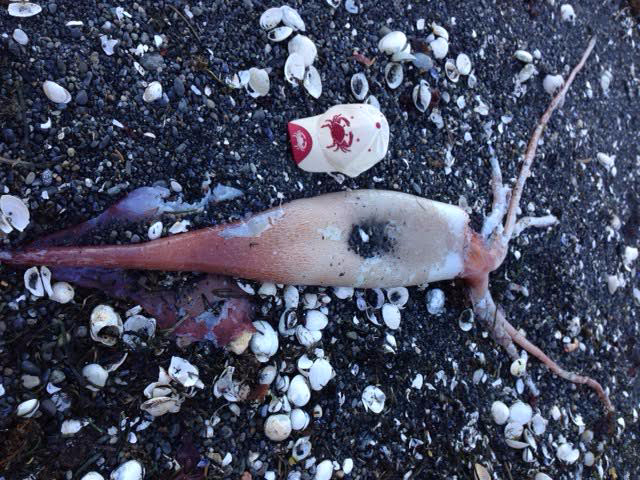 Washington COASSTers Lee and Sue were lucky enough to come across this Humboldt squid during their February survey of Three Crabs Beach. Also referred to as Jumbo squid, these giants are able to swim with speeds of up to 15 miles per hour and are known to eject themselves from the water to escape predators. While the coloring of this squid is mostly white, these cephalopods are able to change their appearance in shades of purple, red and white. 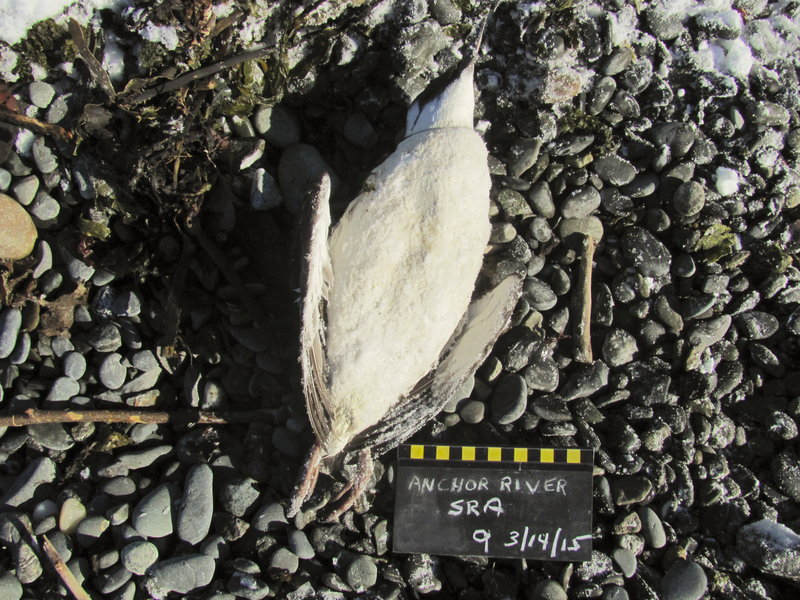 This entry was posted in Uncategorized and tagged Alaska, Common Murre, Giant Squid, Marbled Murrelet, Marine Debris, Washington on 31. March 2015 by coasst.